Here in Australia the leaves are turning and winter is fast approaching. We've farewelled the warmth of summer days and we're enjoying the last bit of colour autumn has to offer. It is my favourite season of the year. In Queensland, we're lucky to have a dry, mild winter - no winter gloom in the Sunshine state - and we only have two seasons: the wet one and the dry. We don't see a changing of the seasons and we seem to move almost seemlessly from summer to winter. It is wonderful to still be experiencing warm days in the middle of May even though the nights are now chilly. The only sign that winter is approaching is the shorter days. But having grown up in a cooler clime, I sometimes miss the changing of the seasons....... no colourful leaves in autumn and no deciduous trees in winter. So today's offering is an ode to those days of my youth when I experienced a true autumn - where the lush green leaves of summer gave way to the fiery shades of red, orange and yellow. This bangle started out as pale shade of lemon but just as the green leaves of summer gave way to the stunning hues of autumn, it now has intense colour and a lovely autumn glow. But unlike the leaves of the autumn tree, these colours will be an everlasting tribute to the changing season. 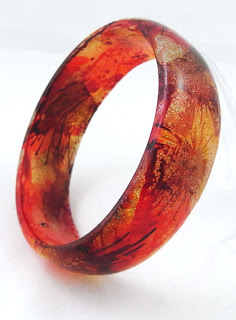 Wow, what a fantastic bangle, the colours are beautiful! Now where can I get one I wonder .....! Fab, thanks for that Mylene, off to have a looksee!